I am realizing, also, that I can't used being tired as an excuse. I mean, it is a major reason why I'm not as patient as I ought to be, but also, I have been tired for nearly a year now. Obviously I need to figure out how to be kind to my kids even when I'm tired, because that probably won't be changing very soon. So. Enter this book. 4 stars: Useful information, with practical suggestions. 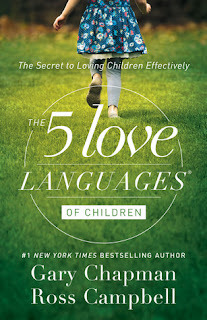 I've known about the 5 love languages for quite some time, but hadn't ever dug into applying it to my children or my relationship with them. From the comments my older two made, I have not been giving them they type of love that resonates most with them. If you're unfamiliar with Chapman's work, he has figured out 5 ways that people feel or receive love from others: quality time, acts of service, words of affirmation, physical touch, and gifts. Of course, everyone likes all of them to some extent, but for each of us there will be one or two that really make us feel the most loved--our love languages. Since I haven't been able to check books out from the library this summer, I actually bought the ebook. I know! Paid full price for it, too, which is even more surprising. Listen, it had been a pretty bad day. I needed something to feel like I was making some positive progress. I decided that really, my main job was to love them. If I could figure out how to do that more effectively, the rest would fall into place. So, just from reading it I couldn't really pinpoint what any of their love languages might be. He gives some suggestions to help you figure it out, including paying attention to what they are always asking for, or on the negative side, what type of discipline seems most effective or most hurtful. He has a whole section on disciplining, by the way, which I found very helpful. You don't ever want to use a child's primary love language as a method of disciplining them, because the message they will receive is not just "I messed up," but "Mom doesn't love me anymore." So for instance, if your child's primary love language is words of affirmation, yelling at them or demeaning them with words in any way would be especially hurtful. He says you should give your kids the most love in the form in their primary love language, but also sprinkle in all the others as well, so they can learn to give and receive all the types. In the 2 weeks or so since I read the book, I have been making an effort to pay attention. My 5-year-old's love language is definitely quality time. He was constantly asking me to do a puzzle with him, stay in his room at bedtime just a little bit longer, or come play with him. No wonder he was especially struggling when we first brought home the baby! I would read half a story, then have to go do something for her. I have made more of a conscious effort to spend that time with him, even with baby on my lap or along for the ride. I'm still figuring out my 7-year-old's primary love language. She always writes little notes for me and other people, but when she's sad she wants me to read a book to her cuddled up on the couch. So, I'm still working on it for her. Meanwhile, I'm pretty sure my 9-year-old is a lot like me when it comes to love languages. I think his two biggest are words of affirmation and physical touch. He has responded the most with my touching campaign, and it has helped our relationship the most that I've noticed. I've also noticed that words affect him deeply. I have always been pretty good about thanking him for helping out (he is such a hard worker! ), but I have been trying to find other ways to build him up with my words. I'm also still working on figuring out my husband's. Trying out a few things here and there. Hey, it is still far from perfect. I am still far from perfect, but I can see it making a difference in our home and in our days together, for which I am thankful. What is your love language? Do you do this with your kids at all? How have they responded?